It's late, so I'm going to keep the first scoop simple. You only need to know one thing about this ice cream: It was born to be in an Oreo Cone. Together, S'mores and Oreo Cone are a treat to be reckoned with on a beautiful day like today. I'll admit I was starved from mowing and so I ate really quickly, but what a great break this made today. The Oreo cone really brought out the marshmallow flavor, and at the same time, the marshmallow really brought out the Oreo flavor. I'll have to do the second scoop in a bowl to be fair, but for the time being, I'm going to remember this one as it is. just so you know, S'mores is Toasted Marshmallow and Chocolate light ice creams with a graham cracker swirl, marshmallows and chocolaty chips. On Second Scoop: This is Edy's, so I knew a plain old second scoop just wouldn't be as exciting, but it's not awful either. My biggest problem, which was my biggest fear, are those chewy little marshmallows that always seem to mess with Edy's flavors. Oh, why do they use these little buggers? Maybe they get chewier from the trip from the factory to the store. However, there are some saving graces here. Overall, it is a respectable flavor. Basically, it's a chocolate pudding with graham cracker crust flavor, and I'd like to make a suggestion: stir this one up and balance out the flavors. It was decent to start, but it seemed to solidify the chocolate graham flavor afterwards. You are a brat for getting to enjoy this on such a beautiful day...I'm SO jealous. Sounds awesome! I have to agree with Dubba - I hate the little marshmallows in this limited edition flavor. This is the 2nd limited edition I've tried (apple pie the 1st time) and I won't be falling for the next flavor that comes out. I'll have to try stirring the smores ice cream to see if it helps camoflauge those little buggers. I think this is a delicious ice cream and my husband and I can't get enough. I personally don't like ice cream that is very rich, so it's just perfect for me. It's definitely a personal palate thing, but I love the marshmallows in it. I almost considered eating it for breakfast this morning. And being that it is not as high in fat as other s'mores versions, that is ideal. I love the marshmallows and their chewiness. This is definately one of my favorite non-plain ice-creams. The graham cracker swirl, which is really like chunks of graham cracker pie-crust, is my favorite part. I have to say that this is one of my all time favorite ice cream flavors. As I have a thing for rocky road, this is right up my alley, and the addition of the graham cracker bits is what puts it over the top. I kick myself for not buying more of it when it was available. The marshmallow parts didn't seem to bother me, but I will admit that it's not fantastic like Phish Food's marshmallows. But considering that this is also much lower in cals than most, it ranks tops for me. I would probably sell my unborn first son for some of this. This S'mores lite is the best ice cream ever!!!! And for the people that don't like it, good more for us that do.....I just wish it wasn't limited time nothing wrong with S'mores in the winter time. 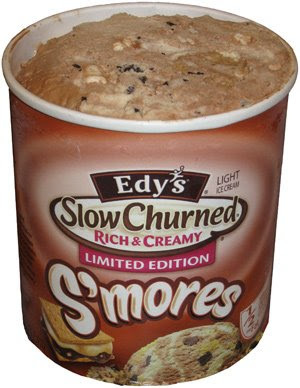 The Edy's grand slowed churned Smore's ice cream is by far the most delicious ice cream I have tried with half the fat. The combination of chocolate ice cream, marshmallow fluff, graham cracker pieces and mini marshmallows is the perfect combination. My only complaint is most stores don't carry this flavor and it's very hard to find. Please stock more stores with flavor and don't discontinue please !!!!! !